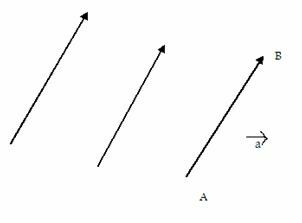 Vectors can be used to represent quantities that involve both direction and magnitude. There are also quantities whic have magnitude but not direction. These quantities are called scalars. a We employ the symbol AB with a ray symbol above it or a with a ray symbol above to denote the vector. Q 1: If vector a = - vector b,is it true that their magnitudes are same. Q 3: Find the length of the vector 3i+6j-2k. Q 4: Which of these is a vector quantity? Q 6: Speed is ____ quantity. Q 7: A negative vector has the same direction as that of the given vector but different magnitude. Q 8: Vectors having the same magnitude and direction are called ____ vectors.